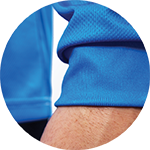 The FLG5 Pro Goalie Jersey is our standard keeper shirt, offering extra room at the forearms for your padding. 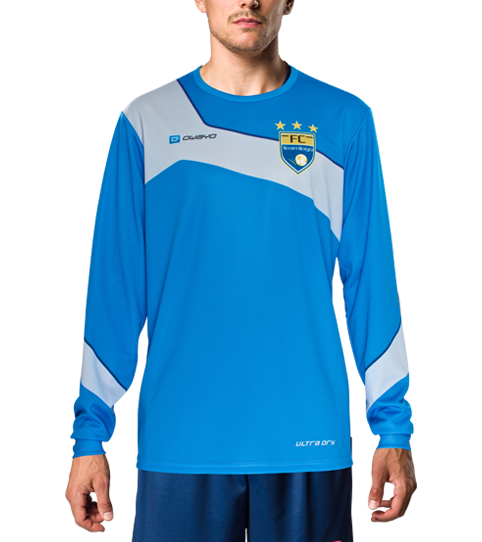 While light and thin, the jersey material is tough and holds its own on the pitch. Narrow Round Collar with hidden seam. 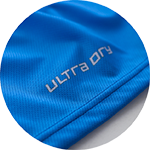 Persperation and moisture is wicked away from the body and evaporates away from the body keeping you cool and dry allowing you to maximize your performance. 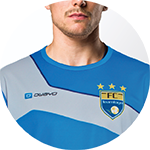 We have introduced the OFIT sizing system to ensure each athlete can find the best possible fit. Smaller size steps make room for half sizes giving men 11 sizes to choose from and women 10 size options. Already have a draft or image of your unique design? Simply send it to us via photo, sketch or graphic layout. Our blank templates for various graphic programs can be found here. We will check if we can offer your desired color in sufficient quality. If so, we will upload the color into your account in the 3D Designer for you. The color will be available in your account in approximately one business day. Are you looking for specific colors? We can load specific colors into your 3D Designer profile. Please select your color system (Pantone, HKS, RAL) via the dropdown menu below and submit your username, color value and email address. We will let you know as soon as the color has been added. If you are interested in adding more than one color to your profile, please reach out to us via info@owayo.com and provide us your username and color specs. Please be aware that the color saturation and appearance on your monitor/screen is not always true to what the color looks like when printed. The perception of color is dependent on the device settings and thus may appear different to the final results, which is why we offer and also recommend to send your color and fabric samples for FREE. This ensures that there are only pleasant surprises when the final products arrive. We can upload your CI colors into your 3D designer profile to ensure you can complete your design. Simply click on the button below to request your special colors. Please email the font file (.ttf or .otf) for your desired font to info@owayo.com. Be sure to include your 3D Designer username (login) in this email. In order to complete your design, we understand that you need to add your logos and crests. 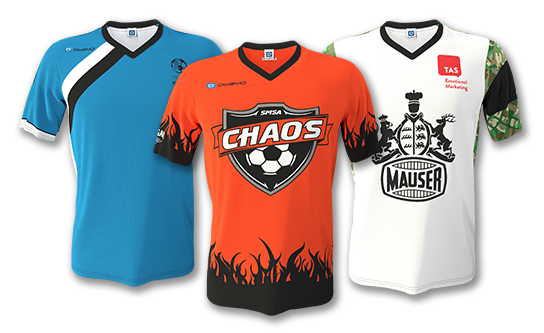 To ensure that everyone finds their place on the jersey, you can add as many multi-colored logos to your design as needed – The cost will NOT increase. Different to many of our competitors, we do NOT flock or glue on your logos or text post production. Instead we take advantage of a complex production method that infuses the colors on a molecular level into the fabric during the production process to ensure that these will never wash out or fall off our products. 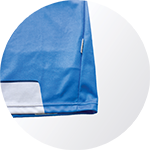 The production method ensures the highest durability and also gives us the ability to print as many logos and text in as many colors to get the job done right. Our patent pending 3DDSN-Technology infuses the textile fibers with color pigments on a molecular level. 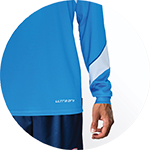 After printing, the fabric remains fully functional - wicking moisture and sweat while transferring heat away from the body. The dyed fibers on our products will always remain elastic, allowing our products to flex with your every movement. We manufacture each order to your design specifications. 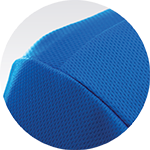 The color infused fibers remain soft to touch, ensuring the highest degree of comfort. 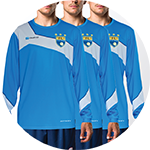 Default Features: Goalkeeper, Long sleeve, K-Tex, Round Neck. For this product, you can pick between various options. The following surcharges and discounts apply per piece. In order to receive a personalized price estimate with the exact products, features and quantity you’d like. 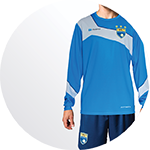 Different product features, for example Short sleeve, Long sleeve can be cumulated, when ordering at least 5 of each variation. When ordering 15 of one variation and 5 from another variation of the same product, you will receive the unit price for 20 items. For the unit prices to cumulate, you must order at least 5 of each variation. Our prices include free choice of design, color, texts and logos – with no hidden costs. This clear cut pricing allows you to easily calculate the cost, despite having multiple inscriptions. owayo also manufactures single orders, complete with your logos, designs and colors. Small orders do have high fixed costs, yet are still possible for just one item. When placing an order, we only accept full payment in advance either via Credit Card, check or Paypal. The Club and School Rewards Program allows registered clubs discounts of up to 20% - without any obligations. Read more about the Club and School Rewards Program.